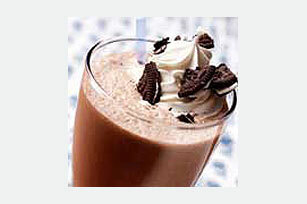 Skip the coffee shop for our rich frappé-style OREO Espresso Milkshake! With crushed cookies and vanilla ice cream, this espresso milkshake is super tasty. Crush 1 of the cookies into fine crumbs; set aside. Place milk, chocolate syrup, ice cream, espresso powder and remaining 8 cookies in blender container; cover. Blend until smooth. Pour evenly into 4 glasses; top with whipped topping and the reserved cookie crumbs. Cool off after an outdoor activitiy this summer with a serving of this frosty ice cream treat. Substitute frozen vanilla yogurt for the ice cream.